Note: Immigrant households include households whose primary maintainer has been granted the right to live in Canada permanently by immigration authorities. In 2011, immigrants were more likely than non-immigrants to live in core housing need. Non-permanent residents** were more than twice as likely as non-immigrants (in general) to live in core housing need – 25.4%. 17% of immigrants lived in core housing need compared with 11% of non-immigrants. Recent immigrants (immigrated in the 5 years before 2011) were more likely than those who had immigrated more than 5 years before to live in core housing need. There was a gradient associated with years since immigration. 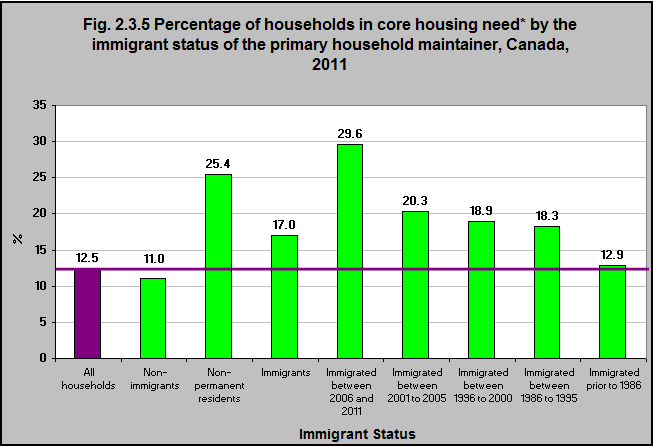 Core housing need decreased according to a gradient from most recent immigrants to those who immigrated prior to 1986. **Non-permanent resident households include households whose primary maintainer is from another country, who has a work or study permit or who is a refugee claimant, and any non-Canadian-born family member living with them.